Finland has a most impressive national healthcare system universally available to all residents. In terms of efficiency against quality, Finland ranks 23rd in the world. Touch wood, we’ve been fortunate to remain relatively healthy during our stay here and have enjoyed precious little in the way of waiting times, received excellent services in English and been generally impressed with the level of service and quality of equipment, facilities and medicines (when necessary). There are moments, however, when we feel as though we’ve stepped into a time machine and been transplanted into the 1950s or so. From the architecture to the fixtures coupled with the design and decor including the furniture in the lobbies, it’s an incredibly surreal experience. 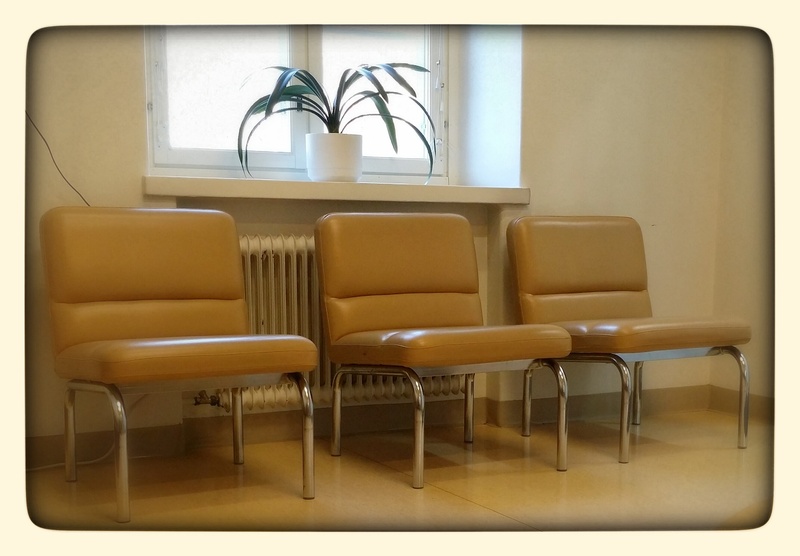 This particular waiting room is situated in the radiology department in one of the local hospital complexes in Helsinki. It’s a gorgeous location not far from our neighbourhood and not far from the very centre of the city. As with much of Helsinki, it is surrounded by a lovely park, and much of the hospital complex seems far too historically significant to house the modern diagnostic tools necessary for a top-notch healthcare system. Yet, it does. When we returned a few days ago to this particular waiting room for a routine part of a check up, we once again marveled at the furnishings. These particular chairs and the very long bench/sofas which matched them could be equally appropriate for the set of Mad Men or in an episode of The Jetsons. What made the experience all the more surreal was the film which was showing on the gigantic flat screen on the wall. Nevermind that the flat screen was a complete mismatch with the rest of the decor. The film playing on it was absolutely perfect. We’ve no idea what the film was nor what was really happening other than what appeared to be a lot of silliness. A Finnish film from most likely the same time period during which the furniture we sat on was manufactured, it perfectly matched the era of the room whilst allowing for a little comedic relief for the nervous patients awaiting their various scans. We watched completely perplexed as various Finnish actors from days gone by paraded around the black-and-white set in a series of dance moves which, quite frankly, made no sense at all. It was fantastic. Utterly and totally fantastic. What a way to spend a bit of time. The scan went well and all is as it should be in terms of our health and well-being. Many thanks to the fantastic folks in the Finnish healthcare system who not only provide great care, but who also might just have a hidden sense of humour which comes through in the most unlikeliest of places.